Robert A. Cumins took two shots of Manhattan from his balcony, one after another, capturing the photograph that would be his most famous. On the morning of September 11, Jewish photographer Robert A. Cumins was running late. He was on his way to a coffee shop down the hill from where he lives in New Jersey for his daily ritual of coffee and breakfast, when a fateful premonition urged him to turn around. Timing was everything, and a split-second decision six years ago made Cumins witness to an international crisis, subsequently placing him on the front page of Peoplemagazine. When Cumins got to the bottom of the hill near his apartment, 28 kilometers west of Manhattan, the light turned red. Cumins was not aware of the exact time, but he knew he was running a few minutes late. At the light he noticed he had forgotten to turn on the radio, which he usually does when leaving his home, and reached over to do so. "Smoke is coming out of a tower and we are trying to get closer," Cumins heard WCBS reporter Tom Kaminsky say from a helicopter above the island. Cumins figured a plane hit the control tower of the nearby Newark International Airport. But as the light was about to turn green, reports confirmed that smoke originated from a fire at the World Trade Center. "Not to sound kitschy, but my mother, a news junkie who passed away a month before, reached out to me from the heavens and said to turn around," Cumins recalled six years after the attack on the Twin Towers. Minutes after the attack, Cumins was standing on the balcony of his ninth-floor apartment looking out over the southern corridor of Manhattan. All he saw was smoke, but it was clear to him that "something significant was happening." Cumins ran downstairs to grab his Nikon 500 millimeter lens, which he bought to photograph the 1993 handshake between Yitzhak Rabin and Yasser Arafat, and returned to his balcony upstairs. As he was putting film in the camera and inserting the lens, Cumins saw a plane work its way northward across the Manhattan skyline. He figured this was just another plane from the airport, but thought the plane juxtaposed to the city on a perfectly clear day would make a good photograph. He lifted his camera and took two shots immediately, one after another. When he shot the third photo, Cumins saw the fireball. But even then, Cumins never imagined what he would learn a short while later, that the plane he had initially snapped had flown into the WTC causing the explosion he had just captured on camera. "When I saw the fireball I lost focus on the plane and said to myself 'Shoot it, get the fireball!'" Cumins explained. "For whatever it was, surrealism takes over, you lose any sense of reality." Cumins remained on the terrace for another few minutes, photographing the atomic looking cloud, and then retreated inside to turn on the television. "I heard people screaming about the second plane that just hit the building, but it didn't occur to me that it was the plane I had seen," Cumins said. It was about an hour later when Cumins, who had not yet made the move to digital photography, had the chance to look at the negatives of his morning shoot. He was working his way backwards on the 18-photograph contact sheet, until he arrived at the frame with the fireball. "Bring that picture up," Cumins told employees at the photography lab where he brings his film to be developed. The first picture is of the plane a split second before hitting the tower, the second shows the tail of the plane and a tiny dot of red and the third shows the fireball. "When I saw it, it all of a sudden became clear to me that the plane I had photographed was the one to hit the WTC," Cumins said, still shocked by the events of that day. "I realized I had made a picture of the plane going right into building." Cumins contacted Blackstar, his agency, who sold the photo to People magazine. The film was processed within one hour and 20 minutes, and People saw it by 11:30 a.m.
"That was probably the first still photo that was seen by any magazine; everyone was still down there," said Cumins. Unlike many of the photographs taken that day which were snapped from east of Manhattan, Cumins shot his from the west, resulting in a hazy, silhouetted image. "The effect is haunting," said Cumins. In American Photo Magazine, where Cumins's photo won best of the year, documentary photographer Steve McCurry wrote: "The starkness of it really reduces the elements to their most basic and fundamental... The moment's there, the composition is there, and the fact that it's a silhouette reduces it to the essentials - skyline, smoke and the impending crash." The photograph also won the National Press Photographer's Association Picture of the Year in the Attack on America Category. It currently hangs at the 9/11 Tribute Center in lower Manhattan and is part of the permanent exhibit. It will be part of the fixed '9/11 Gallery' exhibit at the Newseum in Washington, DC, scheduled to open at the end of this year. Today Cumins knows exactly how long the light stays red at the bottom of the hill near his house, where he decided to turn around six years ago. In the year following the attack, Cumins was still trying to piece the story together. He retrieved a recording of the radio report he had heard that fateful morning in 2001. What he had failed to hear then was that he made his decision to turn around that morning at exactly 8:58 a.m. 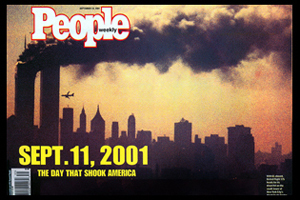 The second plane hit the towers at 9:03 a.m.
"That gave me 4.5 minutes to put the car in front of the building, go to the elevator, run down, run back, go out to the terrace, put the film in and lens on the camera and shoot," Cumins said. "Had I stopped to put the TV on or to call someone, or do anything, or had I had the radio on when I left my parking spot, most likely I would not have taken that picture." Though known now for the photograph he took on September 11, Cumins has worked as a photographer for almost 40 years, largely for the Jewish community. Cumins, 59, got his start as a student in Miami, photographing for AP and local Jewish federations. Just after graduating, he was hired to help "put the Central New Jersey Federation on the map," and since then has worked as the official photographer for United Jewish Communities and its predecessors. "I didn't really know what a federation meant, but I've certainly learned in the last 38 years, and I have met some incredible people along the way," said Cumins, who is currently a freelance photographer. Cumins has photographed every major peace treaty since 1979; he's been to Israel 175 times, and around the world almost as many; he has worked with every Israeli prime minister and he recently traveled with Senator Hillary Clinton on her first trip to Israel since she took office. But it was this one photograph taken from the balcony of his apartment that would define Cumins's career more than anything else. "With everything I've done in the Jewish community, this will be the one thing they write in my obituary," said Cumins. "I always felt it was pretty ironic that I was the one photographer who made this overall image. Here I am, a photographer of the 'Jewish world' community, a photographer of Israel-Mideast peace treaties, one who has worked with politicians around the world...and here, the circumstances of the day put me in that place, in position. How ironic that has always been to me," Cumins contemplated.